Professor Nigel Scrutton has been appointed Director of the Manchester Interdisciplinary Biocentre (MIB), founded at The University of Manchester in 2006 to develop a globally recognised focus of interdisciplinary research at the interface to biology. Professor Scrutton, previously Associate Dean for Research at Manchester’s Faculty of Life Sciences, has a variety of plans to take the MIB into a number of new directions. “Manchester is focussing on a major energy drive through ‘Manchester Energy’ and I would like the MIB to contribute to that,” he explains. “A key area is biofuels and a number of colleagues have landed large grants from the EU and industrial partners in just that area. There are also large projects with the Carbon Trust. All of this will raise our profile in the enormously important field of energy research. “In addition I want to raise further the exposure of our biotechnology groups, which are investigating for example the use of enzymes in industrial processes. Again we have won large grants in that area. Professor Scrutton says his plans fit well with the MIB’s research themes. Designed to encourage interdisciplinary research between biologists and physical scientists to achieve a quantitative understanding of biology, the MIB focuses on Systems Biology, Biomolecular Mechanisms and Catalysis, and Molecular Bioengineering, with key support from an Enabling Technology arm. It now boasts work with all four University Faculties and other groups such as medical/engineering research groups within the Manchester Integrating Medicine and Innovative Technology (MIMIT) centre. “I was delighted to be appointed Director. I am passionate about the types of bioscience that interact with physical sciences and engineering, and the MIB provides a superb environment for work of this type,” he adds. 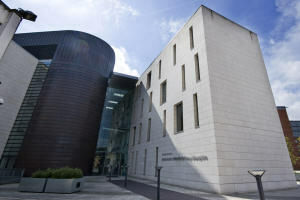 The MIB building project was supported externally by the Wellcome Trust and the Wolfson Foundation. It now has a total live grant portfolio worth over £40M and its annual research income is £13M. For more information or an interview with Professor Nigel Scrutton, contact Media Relations Officer Mikaela Sitford on 0161 275 2111, 07768 980942 or Mikaela.Sitford@manchester.ac.uk. Professor Nigel Scrutton, 46, received a first class degree in Biochemistry from the University of London, King's College (1985), and his PhD (1988) and ScD (2003) degrees from the University of Cambridge. At Cambridge he held a Royal Commission for the Exhibition of 1851 Research Fellowship (1988-91), College Research Fellowship (1989-92) and a Royal Society University Research Fellowship (1991-1999). In 1995 he moved to the University of Leicester as Royal Society University Research Fellow where he later became Lister Institute Research Professor of Biochemistry (1999-2004) and Professor of Biochemistry (1999-2005). He was subsequently appointed Professor of Molecular Enzymology at the University of Manchester (2005), BBSRC Professorial Research Fellow (2006-2011) and Associate Dean for Research (2008). He is recipient of the Biochemical Society Colworth Medal, the Royal Society of Chemistry Charmian Medal, the RSC Rita and John Cornforth Award and a Royal Society Wolfson Research Merit Award. Nigel has research interests in the mechanisms and structures of enzyme systems, with particular emphasis on understanding the physical basis of biological catalysis. His work is set at the interface of chemistry, biology and physics and is focused on elucidating fundamental mechanisms of enzyme systems from the quantum to macromolecular levels. His discoveries include new modes of enzymatic H-transfer by quantum mechanical tunneling mechanisms, conformational control of biological electron transfer reactions and the rational design/redesign of protein systems to catalyse new chemical transformations. A major current drive is to understand the nature of the coupling of dynamics to reaction chemistry. The group also has major interests in the application of enzymes in biotechnology.